Rick Gibson known for over 15 years, responds immediately to problems. He is very knowledgeable when it comes to diagnosing and assessing problems when it comes to any appliance. He honestly lets you know the state that your appliance is in and what work would be required to ensure it keeps on working. He is very fair when it comes to quoting cost estimates for required parts and his time for labour. 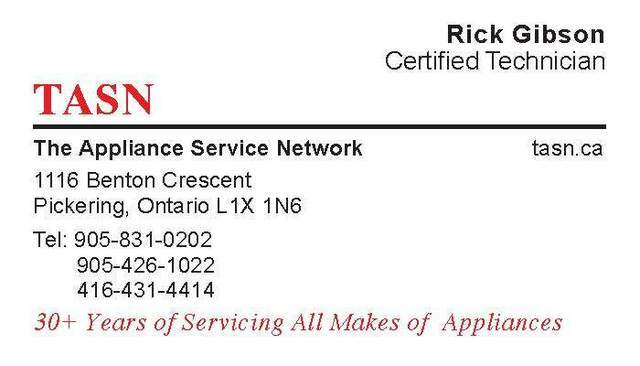 I highly recommend Rick to anyone looking to have a genuine, hard working and very knowledgeable technician on your side. My dryer wasn't working properly. I emailed TASN and they replied right away. We set a day and Rick came and fixed it in no time. He diagnosed the problem quickly, and had the needed part in his van. Rick was so nice and helpful with 30 plus years experience. It was great too that he cleaned up the area when he was done. I never would have known he dismantled and then reassembled my dryer. He also was super-friendly and great with my super-friendly dog. Thank you Rick. Rick was great! He took a look at my washing machine and gave me an honest answer (which you don't always get these days). Basically said that he could fix my washer, but for the cost of the fix(and approximate age of my washer) I could go either way. So at this point I'm buying a new washing machine. Rick was super nice and honest. Will definitely be calling him for all my appliance repairs, and referring family and friends! Rick responded to my email request in a prompt manner. He was extremely courteous and fixed the problem with our washing machine quickly. This was an excellent experience and we would highly recommend him to anyone in need of appliance repair. Rick was efficient and friendly-arrived on time-found the problem and fixed it. Took off his overshoes and left them in the hall. A very pleasant experience. Would definitely recommend him to others. We recognize that we are providing a service but are doing so in your home. Therefore, we strive to be respectful in all aspects of the experience. On Friday afternoon our washing machine quit and we called TASN. Rick arrived at our house Saturday morning, and phoned us prior, letting us know he was on his way. Having not dealt with TASN before, we were relying on his Google and HS reviews. All of them held to be true. Rick arrived, was courteous, professional and quick. He diagnosed our problem, and gave us a variety of options to proceed with. Ultimately, he strongly recommended to purchase a new machine, rather than fix the old one. It was nice to have a service professional give us his honest opinion. He also guided us in the direction of major brands to avoid, and ones that are reliable and easier to repair down the road. I'll be phoning Rick again when it's time to repair an appliance in our house. Advice is only useful if it comes from a trusted resource. We strive to provide our customers with honest educated information which they can rely on when making repair/purchase decisions in order to develop and maintain an ongoing relationship. We look forward to serving you in the future. I had some problems with our Electrolux dishwasher and KitchenAid Refridgerator. I have tried many Service Techs from Business owners to folks like Sears and have not really been satisfied. Either they were lazy with the service or lazy to even order parts. I saw Rick's reviews thought that I would give him a try. I figured with all the reviews and high scores he had that I couldn't go wrong. Well, his ratings were TRUE. I called him up and he came over and was able to diagnose the issues. A couple of days later, he was able to get me my quotes for the parts and the timelines for receiving them. He was true to his word. He followed up with me and within a couple of weeks (due to back order of parts) he was able to install everything and my appliances are running very well. Thank you for your review. We know that as an appliance owner, you have many options for your service needs and we strive to set ourselves apart from the rest by providing quality service at a fair price as quickly as possible. We also strive to communicate with the customer as to the status of the situation if there is a necessary delay. Rick responded quickly to our service request and had it fixed in one day. Rick always provides great, friendly service. 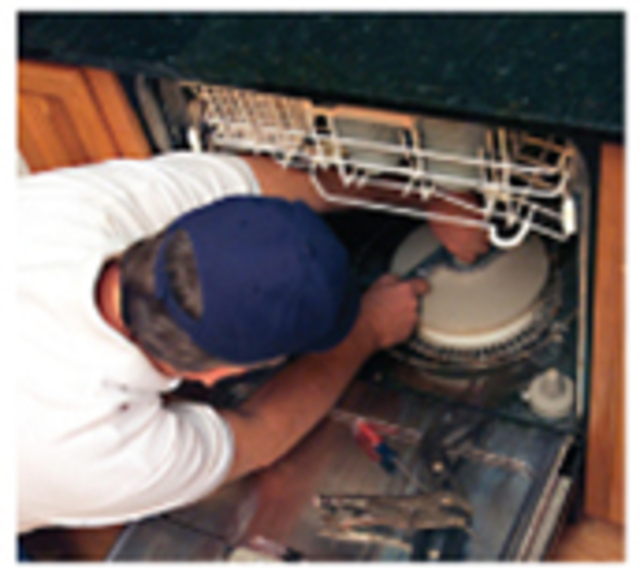 We are able to call him for any of our appliance repairs. 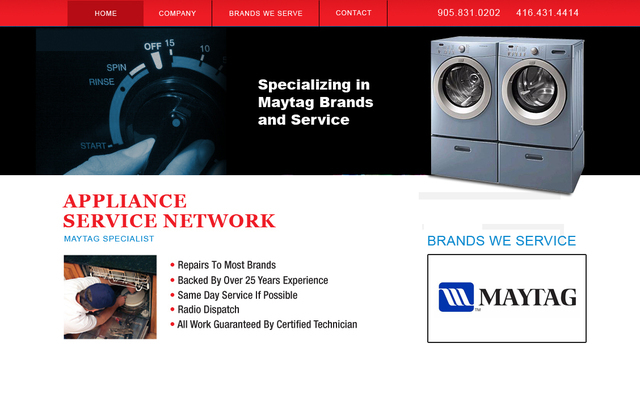 We exist in a community and seek to service the appliance repair needs of our neighbours. We view our customers as such and our technicians strive to be friendly, courteous and efficient just as they would for the person that lives next door. My 4 yr old Kenmore dryer was not heating up, so I looked on Homestars and found TASN (The Appliance Service Network). Rick was able to come the next day. He determined that my dryer was manufactured by Samsung, and needed a new heater. He had the part with him and installed it very quickly. As he went he explained to me what he was doing and even vacuumed out the inside. Great service, will definitely call Rick for future appliance repairs. We maintain a truck inventory of parts allowing us to fix many problems on the spot. We have also established relationships with reputable part suppliers to enable us to obtain necessary parts as quickly as they are available.